Fly into Himalayas with Druk or Tashi Air. The green walls of the hills known as dooars or gateways into Bhutan from the plains climbs continually higher as the plane flies north towards the Tibetan border. Silvery rivers thread the valleys, waterfalls plunge down the forested mountainsides and to the north, the great snowcapped peaks of the inner Himalaya rise up into the sky. As the aircraft enters the Paro valley, look down and you will see the Paro Dzong overlooking Paro Chu (river) with Ta Dzong, watch tower, now the National Museum, above it. Received by Bhutan Mindful Travels' representative at the airport and after completion of airport formalities, drive through fascinating valley of Paro to the hotel. Evening visit to Paro market and take a stroll through town’s main street. Dinner and overnight at the hotel in Paro. After breakfast in the hotel, drive to Drukgyel Dzong, a ruined fortress from where Bhutanese warriors fought Tibetan invaders centuries ago. 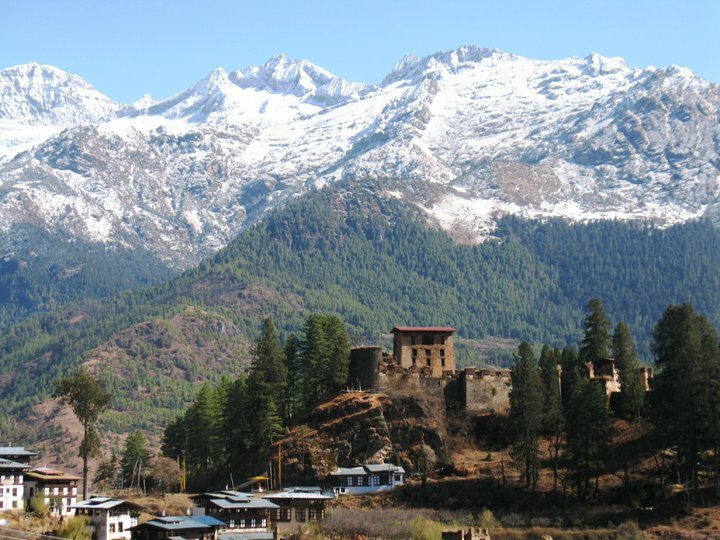 The snowy dome of sacred Chomolhari, “mountain of goddess” looms directly over the Dzong. Along the way, see the 7th century Kyichu Lhakhang, one of the 108 temples built in the Himalayas by Tibetan King, Songtsen Gembo. 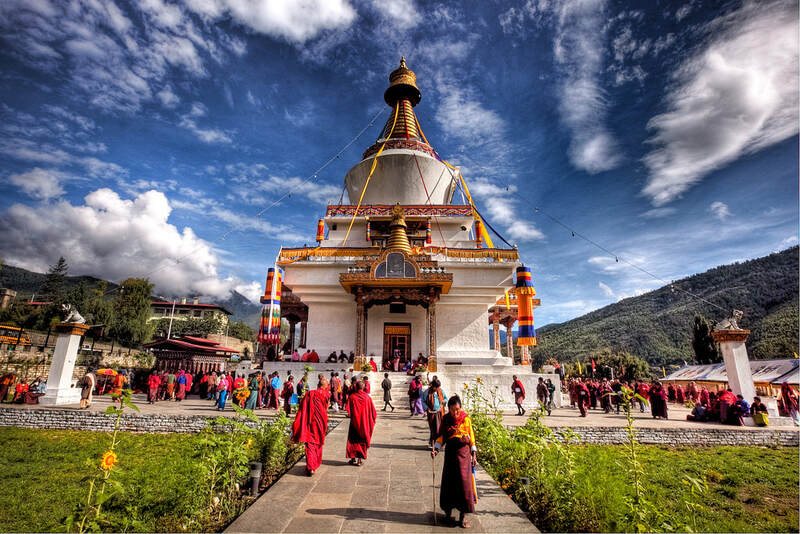 One of the most sacred shrines in the country, it reflects the introduction of Buddhism in Bhutan. After lunch, visit to Ta Dzong, originally built as Watch Tower, it now houses National Museum of the Kingdom and boasts antique thangkha paintings, textiles, weapons & armour, household objects and a rich assortment of natural and historic artifacts. Then walk down the trail to visit Rinpung Dzong, meaning ‘fortress of the heap of jewels’ which has a long and fascinating history. Along the wooden galleries lining the courtyard of the Rinpung Dzong are fine wall paintings illustrating Buddhist lore such as four friends, the old man of long life, the wheel of life, scenes from the life of Milarepa, Mount. Sumeru and other cosmic Mandala. After that proceed to Thimphu, the capital town of Bhutan. The road leads through the Paro valley to the confluence of Paro and Thimphu rivers at Chuzom (confluence). Three different style of chortens adorn the confluence. A short way beyond on the left, is Tachogang Lhakhang, the temple of the hill of excellent horse. It is private temple, built in 15th century, as the result of visitation from Balaha, the excellent horse, a manifestation of Chenrezig, the compassionate Buddha. After the narrow, rock lined section of the road opens up as Thimphu approaches, Simtokha Dzong lies enroute. Simtokha means the place of profound tantric teaching, this dzong now houses a school for the study of the Dzongkha language. On arrival in Thimphu, check into the hotel. Evening, time for exploratory walk before dinner. After breakfast, sightseeing of Thimphu valley includes, visit to National Library, a treasure trove of priceless Buddhist manuscripts. The Traditional Medicine Institute, where centuries old healing arts such as acupuncture and herbal remedies are still practiced. The Painting School, where young students learn the art of Buddhist arts and crafts. Also visit mask maker workshop and workshop for fine metal craft, weaving, ceramics and paper making. Then visit, Textile and Folk Heritage Museum, a fascinating testimony of Bhutanese material culture and living traditions. Afternoon, visit to Tashichhodzong, ‘fortress of the glorious dharma’. It is the center of government and religion, site of King’s throne room and seat of Je Khenpo or Chief Abbot. Built in 1641 by the political and religious unifier of Bhutan, Shabdrung Ngawang Namgyal, it was reconstructed in 1961 in traditional Bhutanese manner, without nails or architectural plans. Also visit King’s Memorial Chorten continuously circumbulated by His Majesty’s subjects, spinning prayer wheels and murmuring mantras. Then, visit Handicrafts Emporium and local shops if you like to browse through example of Bhutan’s fine traditional arts. Here you can buy textiles, thangkha paintings, masks, ceramics, slate and wood carvings, jewellery, interesting items made from local materials, and all manner of unique objects. Evening drive to Paro for overnight stay.